A quick look at harbor seal population trends around the world suggests that there have been ups, downs, and even some unknowns- catastrophic crashes in one part of the world while numbers grew in another and scientists couldn’t determine the pattern in a third. This wide-spread species shows corresponding variation in population status, but three big themes seem to run through the scientific literature: competition with humans, pollution, and disease (and the number of studies looking at this third issue really surprised me). Humans and harbor seals tend to clash due to the lure of salmon and other tasty fish. Prior to passage of the US Marine Mammal Protection Act in 1972, some states paid bounties for harbor seals because of concerns that they competed directly with fishermen for certain valuable species (Lelli et al. 2009)- an estimated 72,284-135,498 seals were killed in Massachusetts and Maine between 1888 and 1962. Those concerns continue today- in Saint John Harbour, New Brunswick, for example, harbor seal numbers appear to increase during the yearly alewife migration (Browne & Terhune 2003), while in the Cromarty Firth, Scotland, harbor seals were more often seen within the freshwater river system during salmon migration (Middlemas et al. 2006). And the spread of aquaculture has provided more opportunities for human-seal conflict- along the New England and Canadian Atlantic coast harbor seals have damaged fish cages and eaten farmed salmon (Jacobs & Terhune 2000). Given how much we depend on oceanic resources for food and concerns over fish stocks, it’s no wonder that we’re worried about competition with these animals. Through the early 1970s harbor seals were hunted along the Pacific and Atlantic coasts of North America and in Europe, but later legislation enacted by governments provided protection. The US Marine Mammal Protection Act states that populations of species such as harbor seals should be maintained at a level that allows them to remain a significant part of the ecosystem. Why should we continue to protect these seals if they are causing damage to aquaculture and taking fish we could use? Well, I think that there are (at least) two ways to respond to that. To begin with, I do think we have to ask ourselves whether we over-consume the resources around us and whether we could make do with less so that other species can continue get the resources they need to survive. The other element is the long-term impact of removing high-level consumers from any food chain- the effects can be bad for the entire system, including us. I found a study which suggested that our over-harvest of large whales in the Pacific led to a cascading decline in seals, sea lions, and even sea otters because killer whales turned to other food sources when whales become scarce (Springer et al. 2003). The loss of sea otters then meant that sea urchins could overgraze kelp beds with the result that abundance and diversity of total sea life declined. Ecosystems can be pretty complicated, and removing one piece from the web can cause the whole thing to unravel. Water pollution also took its toll on harbor seal populations and in some cases prevented populations from recovering once they were granted legal protection. European populations in the North and Baltic Seas showed high levels of DDT and PCB contamination (Helander & Bignert 1992), both of which cause decreased reproductive success in mammals. These types of chemicals were also implicated in hormonal and metabolic problems found in dead grey and ringed seals in the Baltic (Bergman & Olsson 1986). This means that exposed animals may be less able to fend off future diseases. Why should we worry about organochlorines in seals? If you want to evaluate water quality, one of the best indicators is the health of animals living in that water- if seals are contaminated, it is likely their prey is as well, and that means that our prey is, too, as well as the water which cools us off on a hot day at the beach. Disease appears to be a pretty big deal as well. And I will be honest that I did not expect to find so many references to this in the literature- seal pox, seals dying from influenza which appeared to originate in birds, a seal fever in Iceland- it was a little overwhelming. A phocine distemper virus killed roughly 60% of the harbor seals from Sweden to the eastern coast of the UK (and up into the Scottish Isles) in 1988 (Dietz et al. 1989), and a (possibly) second wave with lower mortality came through in 2002 (Thompson et al. 2005). 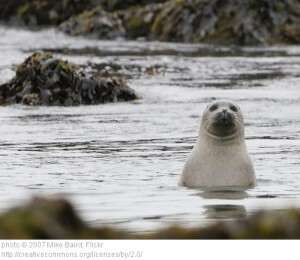 Seals with higher levels of organochlorines were more likely to die from the virus, indicating that their immune systems may have been compromised by chemical contamination. These disease epidemics are worrying on several levels: to begin with, they severely reduce seal populations which makes these populations more vulnerable to extinction and can lead to loss of genetic diversity. They could also be a statement about the general health of the ecosystem- more disease outbreaks could mean bigger ecological problems. And it is also possible that humans can be directly impacted by animal diseases (think about H1N1 or rabies…), so healthy seals are probably a good thing for just about everyone. Harbor seal populations have experienced large fluctuations around the world over the last 100-150 years. Although protection has helped some populations rebound, such as in New England, there are still concerns for other populations. The problems I’ve described here offer something of a long-term perspective, looking at harbor seals through the 20th century- it’s likely that there are other issues facing which have arisen in the last decade. For my next post, I’ll concentrate on recent trends in harbor seal populations and the outlook for the future. Bergman, A and M Olsson. 1986. Pathology of Baltic grey seal and ringed seal females with special reference to adrenocortical hyperplasia: is environmental pollution the cause of a widely distributed disease syndrome? Proc. from the Symposium on the Seals in the Baltic and Eurasian Lakes, 1984-06-05-08. Finn. Game Res. No. 44: 47-62. Browne, CL and JM Terhune. 2003. Harbor seal (Phoca vitulina, Linnaeus) abundance and fish migration in the Saint John Harbour. Northeastern Naturalist 10: 131-140. Dietz, R, Heide-Jorgensen, M-P, and T Harkonen. 1989. Mass deaths of harbor seals (Phoca vitulina) in Europe. Ambio 18: 258-264. Helander, B and A Bignert. 1992. Harbor seal (Phoca vitulina) on the Swedish Baltic coast: population trends and reproduction. Ambio 21: 504-510. Jacobs, SR and JM Terhune. 2000. Harbor seal (Phoca vitulina) numbers along the New Brunswick coast of the Bay of Fundy in autumn in relation to aquaculture. Northeastern Naturalist 7: 289-296. Lelli, B, Harris, DE, and A-M Aboueissa. 2009. Seal bounties in Maine and Massachusetts, 1888 to 1962. Northeastern Naturalist 16: 239-254. Middlemas, SJ, Barton, TR, Armstrong, JD and PM Thompson. 2006. 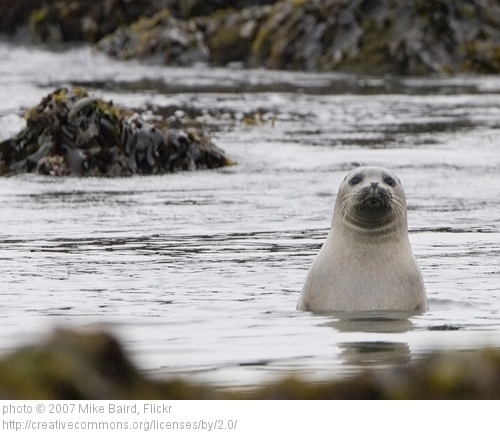 Functional and aggregative responses of harbour seals to changes in salmonid abundance. Proceedings: Biological Sciences 273: 193-198. Springer, AM, Estes, JA, van Vliet, GB, Williams, TM, Doak, DF, Danner, EM, Forney, KA and B Pfister. 2003. Sequential megafaunal collapse in the North Pacific Ocean: an ongoing legacy of industrial whaling? PNAS 100: 12223-12228. Thompson, D, Lonergan, M, and C Duck. 2005. Population dynamics of harbour seals Phoca vitulina in England: monitoring growth and catastrophic declines. Journal of Applied Ecology 42: 638-648.